2020 Goals: Double the local production of renewable energy each year AND Reduce the total energy consumption in the built environment by 15%. What is the Energy Action Team? We are a diverse group of professional and volunteer energy enthusiasts working in the renewable energy and energy efficiency sectors. 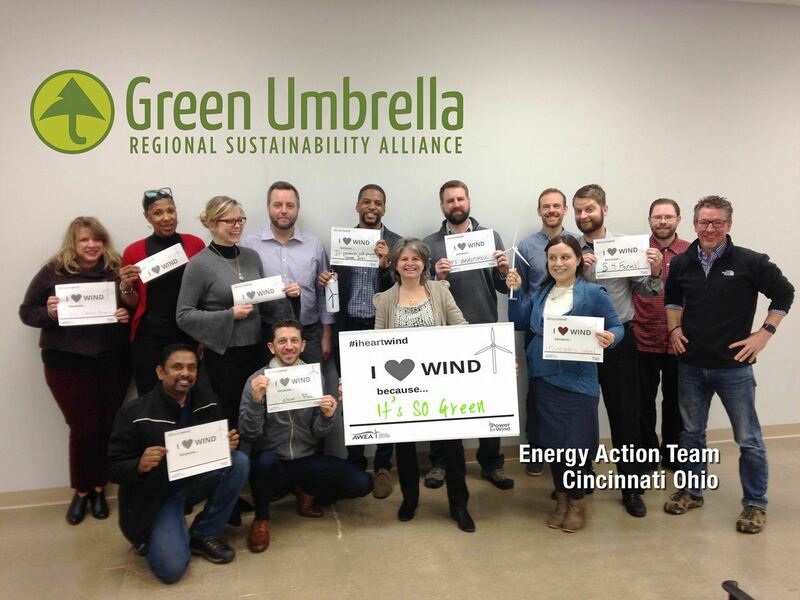 Team members include commercial and residential renewable energy developers, installers, marketers, educators and customers, as well as organizations that specialize in energy efficiency and retrofits. We work together to conserve energy and transform the grid. Cincinnati has the first city aggregation program in the nation to offer 100% carbon free energy for both natural gas and electricity. All electric aggregation program participants receive 100% green energy. It is the largest carbon reduction program in the City and abates approximately 250,000 tons of CO2 annually, while saving residents $1.5 million on electricity and $2 million in natural gas costs. Over 20,000 homes in Ohio have solar. Find out if solar is right for you. Solarize Cincy makes purchasing solar panels for your home easy and affordable. PACE offers zero down payment, long-term financing for commercial energy-efficiency retrofits, allowing you to increase property value, reduce energy costs and generate a positive cash flow from year one. Through a partnership with the Multiple Listing Service (MLS) of Greater Cincinnati, homeowners and real estate agents are now able to highlight 88 new green features, including a variety of energy saving enhancements and building rating information such as LEED, Home Energy Score, HERS rating and ENERGY STAR. Meet some of Cincinnati's High Performance Homes and find out how you can capitalize on energy efficiency and high performance features, whether you're a homeowner, real estate agent or builder. Meetings are held on the second Wednesday of each month from 8:30 - 10:00 am.